Like the girth hitch, the hitch that I am thinking of is not typically the best choice for rigging a pit rope. With a short piece of rope, cord, or webbing, it provides a fast and easy way to rig a handline. I wish I had a digital camera, but I don't, so I'll describe it instead. It is very similar to the girth hitch--but it is not quite the same thing. Here's a shortcut description: this is what you would get if you tried to tie a tensionless hitch, but did only one wrap. Take your rope/webbing and tie an endline loop in it. Run the loop around the anchor point (e.g. tree, rock) 360-degrees, and then put the entire length of rope/webbing, starting with the other end, through the loop. Pull tight. If the loop is big enough compared to the circumference of the anchor point, you'll get a girth hitch. But if the loop is small, it won't be able to girth hitch around the anchor point, and instead of having two pieces of rope/webbing coming out of the hitch (to a knot which joins one to the other), you instead have one piece of rope coming out, which immediately becomes the standing end. I've heard this referred to as the girth hitch; I've even called it that myself. But, strictly speaking, it's not a girth hitch, is it? What is it actually called? ek wrote: Take your rope/webbing and tie an endline loop in it. Run the loop around the anchor point (e.g. tree, rock) 360-degrees, and then put the entire length of rope/webbing, starting with the other end, through the loop. Pull tight. I think you're referring to a Choker Hitch. You don't have a digital camera? Scott McCrea wrote: Bale Sling Hitch? (3) a bale sling hitch (tied with the same piece of cordage as the handline or pit rope), where both pieces of rope are loaded but one of them could be loaded more than the other, and where the two pieces of rope coming out of the hitch are actually the two sides of a single loop knot. NZcaver wrote: I think you're referring to a Choker Hitch. Or very close, anyway. The way I am thinking of tying it is without any connector--that is, with the endline loop tied directly around the standing end. Tying it without a connector makes it a bit less "choking", as there is more friction between the endline loop and standing end than there would be between a metal connector (carabiner or maillon/quicklink) and the standing end. NZcaver wrote: You don't have a digital camera? You have described what I prefer to call a Girth Hitch. Clifford Ashley and some other knot authors call this hitch, where only one end is loaded, a Cow Hitch. I read some statement that it was insecure compared to the Clove Hitch. I tried it with some half inch rope on a carabiner. It seemed secure. I then tried it on a larger object. It practically fell off. Ashley and Geoffrey Budworth call the hitch tied with a continuous loop and both ends load either a Bale Sling Hitch or a Ring Hitch, depending on the shape of the object it is tied around! See page 105 of Budworth's Ultimate Encyclopedia of Knots. The same hitch is tied in the same way around two different objects and given two different names. All on the same page!! This is why I do not use those names. I prefer Girth Hitch. Girth is a term based in Middle English. The hitch with both ends loaded was called a Lark's Head Hitch in the 1870 Book of Knots by Tom Bowling. This was a translation of a French work and the first book about knots published in English. Many of the knot names were translated French. Ashley decried the use of French names for knots that had perfectly good English names for centuries. The name Lark's Foot appears to have originated as an error in Modern Rope Techniques by Bill March in 1973. He showed the hitch used for a foot loop. He probably meant to say Lark's Head, but called it Lark's Foot instead. The book was prestigious enough so that his error was copied into many other climbing books. This error eventually got copied into Alpine Caving Techiniques where "tete de'alouette" (head of lark) got translated to Lark's Foot. Then it's not the hitch I'm talking about. The cow hitch has an end free that can slip out. The hitch I am talking about does not. No matter how smooth the object is that it's tied around, it cannot slip out. If it were tied to a short post, potentially it could slip off the top of the post...as could a fixed loop knot or tensionless hitch. I now believe that the correct name for the hitch I've been asking about is actually the running <knot>, where <knot> is the name of the endline loop knot used. So if a bowline is used, it's a running bowline; if an overhand on a bight is used, it's a running overhand on a bight (or running overhand loop or running overhand for short); if a figure-eight on a bight is used, it's a running figure-eight on a bight (or running figure-eight loop or running figure-eight for short). However, the running loopknots are typically described as being tied without an object, and then placed over an object. The method of tying that I am describing involves tying the knot around the object; in this sense, I suppose that you could say that I am describing a family of "rethreaded" running endline loops. With all technical correctness aside, I am wondering if it is useful to speak of these knots in this way, or if it's most useful to call it a "bale hitch" or to (incorrectly) call it a "girth hitch." My motivation for creating this thread (no pun intended) is that the hitch that I am describing is a very fast way to rig a handline to a single anchor point, if the cordage used for the handline is short. I would be hard pressed to rig a pit rope in this way, but I use it for handlines all the time, and I'd like to know what I can call it when I'm talking about it. In rock and ice climbing, this hitch is commonly used when rigging load-sharing toprope anchors off of two trees with webbing, though I'd avoid it for any anchor that could take a lead fall (because a very hard lead fall could potentially break an undoubled piece of 1" tubular nylon webbing with a knot in it--not because rigging in this way is particularly weak compared to the girth hitch or overhand). While the history of this hitch is certainly interesting, the term Choker Hitch still seems most appropriate. That's what they seem to call it in the logging industry and the industrial rigging world. I suspect some of those guys were using this technique with steel cables long before Ashley tied his first knot. The Choker Hitch seems like a nice quick way to rig a handline. I'd do it. Actually I think I have done it. If you're rigging a full load-bearing rope (or webbing) this way, be aware of the potential for nylon-on-nylon friction at the point when the bight connects with the standing end. Or just rig a carabiner or maillon in there, like you mentioned earlier. 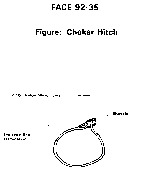 NZcaver wrote: While the history of this hitch is certainly interesting, the term Choker Hitch still seems most appropriate. That's what they seem to call it in the logging industry and the industrial rigging world. I suspect some of those guys were using this technique with steel cables long before Ashley tied his first knot. Oops! In my previous post, when I said "bale hitch," I meant to say "choker hitch." NZcaver wrote: The Choker Hitch seems like a nice quick way to rig a handline. I'd do it. Actually I think I have done it. If you're rigging a full load-bearing rope (or webbing) this way, be aware of the potential for nylon-on-nylon friction at the point when the bight connects with the standing end. Or just rig a carabiner or maillon in there, like you mentioned earlier. This is why I wouldn't be likely to rig a pit rope in this way. That, and the potential load-magnifying effects of having a girth hitch at a high angle. But neither of these is likely to cause failure, I think. I think the friction could slowly wear out the rope, though, and require that it be retired (or cut) prematurely. But it's not much movement of nylon on nylon. If you have a very stretchy rope, and a very smooth anchor point with a big circumference, then I can see how it could become a serious problem. If using hardware there, it's important to make sure it's not being loaded badly against the anchor point, which could potentially snap it like a Graham cracker. This seems like a more likely failure than the friction problem. What he said, allthough I do refer to this as a running bowline when I actually USE a bowline to make the loop. Otherwise I just call it a choker hitch, which may or may not be correct, but I think most usefull or recognizable. Especially when you may be using different materials: cable and clevis, spliced or stitched eye, knot, etc. Also, I think that the nylon on nylon rubbing is only a concern under certain cicumstances which are not really all that common. Basically, if you snug it up and make sure the hitch doesn't become loose and then suddenly load, you'll be fine. If there is that possibility something else should probably be used. chh wrote: Also, I think that the nylon on nylon rubbing is only a concern under certain cicumstances which are not really all that common. Basically, if you snug it up and make sure the hitch doesn't become loose and then suddenly load, you'll be fine. If there is that possibility something else should probably be used. If you kept this rigging in place for a very long time, and used it over and over and over again, and never inspected it to make sure it was still OK, then I think it might fail. On the other hand, that is also the case for the water knot--the tails can gradually slip through...but you'd have to load it cyclically for a very long time without inspecting it to make sure it was still OK. Still, I am not recommending this hitch for rigging pit ropes. There are several preferable options. A tensionless hitch can be released under load, and if it's rigged correctly (or even if it slips a little bit), the knot is always easy to untie. A bowline is simple and quick with rope--if I am rigging a handline with rope or accessory cord, I will typically tie a bowline. I believe bowlines to be acceptable with webbing and sometimes tie them in webbing, but I find that they are harder to tie and harder to verify as correct in webbing. A figure-eight follow-through (a.k.a. rethreaded figure-eight) is extremely easy to recognize as correct. Furthermore, the choker hitch is only easy for placing handlines because handlines are typically not particularly long. Thus a quick endline loopknot can be tied, and the entire length of the cordage can be pulled through it. For most SRT rigging, it would be time-consuming to rig in this way, and faster (if insisting on the choker hitch) to tie the loopknot around the standing end of the rope (rather than to bring the standing end--i.e. the entire length of the pit rope--through the loop). If one is tying a fixed loop around something anyway, then one may as well just tie it directly around the anchor point! The choker hitch has the disadvantage for SRT rigging that it does not provide a clip-in point. Bowlines and figure-eight follow-throughs can be clipped into with a cowstail. Wrap 'n pull anchors with webbing can be clipped into, as can basket rigging if you make sure to clip both sides of the sling (or just clip the connector). You can even use the loop in a tensionless hitch as a clip-in point (as the weight of the standing end, even if minimal, is sufficient to keep it from slipping, if the hitch is correctly tied). But if you clip either the "major loop" of a choker hitch (the slippy loop around the anchor point) or the "minor loop" (the fixed loop through which the standing end runs), then when you fall or sit down on it you'd likely pull up the standing end and fall an unlimited distance. There is a fixed rope rigged to a natural anchor (a rock handle) with a choker hitch in South Pittsburg Pit (TN). A friend of mine clipped it with his cowstail for safety (I pointed out to him why this would probably not work out well, and he used his QAS instead). I think that SRT anchoring methods that provide loops that look attractive for clipping into but actually wouldn't hold should be avoided! For the same reason, I think most uses of the directional figure-eight (a.k.a. in-line figure-eight) should probably be reconsidered in favor of the alpine butterfly, since you can clip an alpine butterfly, but if you clip the loop of a directional eight and the anchor it's attached to fails, you're loading the directional eight in the wrong direction. ek wrote: Then it's not the hitch I'm talking about. My mistake. I read "endline loop" as :endless loop" in the original message. Bob Thrun wrote: My mistake. I read "endline loop" as :endless loop" in the original message. No problem. I believe your comments are right-on, as applied to the hitch you were talking about (the cow hitch). Also, excellent historical information regarding the origin of the term "lark's foot!" It's too bad I don't have a usable camera. Many ideas need to be expressed in words, and sometimes pictures serve only to inflame people's emotions. But SRT rigging is certainly one of those fields where a picture is often more effective than words! You're right, I would be surprised. But you make a good point. My statement that you need to rub a long length of rope against a short length to cause failure is based on the "trail of dead bodies"--people who have rigged in such a way as to allow that to have happened...and then suffered the consequences. But major dynamic loading events are rare, so I could imagine that there could be a rigging technique that is commonly used and which still doesn't afford the level of security that its practitioners assume. Are there accident reports, or destructive tests, that show that loosely tied knots and hitches slipping tight in a major shockload have broken? No, I don't know of any reports or studies, though I'm sure they exist. I was speaking mostly from experience with cranes and crane straps which can be nylon or spectra. We use the choker hitch quite a bit, but frequently use a clevis as the "running" part of the equation. This is both easier to attach (to avoid putting the entire strap through the stitched eye, which is often attached to the ball of the crane anyway) and it provides a protection against the nylon on nylon issue. The straps themselves are often fine on their own, but I have seen glazing from the choker tightening down without the clevis on heavy pieces, albiet minimally. But then again we're only talking about a few inches of play here..... Regardless, it just isn't something you want to be thinking about with thousands of pounds hanging over your head. Now that I think about it though, you tend to see the softning or slight glazing on nylon straps, where distortion of the fibers is a more common effect on the spectra straps. I would assume this would have something to do with the elasticity of nylon as opposed to that of spectra. As far as caving is concerned, however, I can't really think of an accepted rigging practice off the top of my head that would seriously compromise the fibers of the rope or webbing when used correctly. Nothing that would shock anybody, i.e. no "trail of dead bodies". Though I have used 7 mil rope before, I haven't used a choker hitch as an anchor point with it. At least not for anything more than a handline. For vertical caving with smaller diameter ropes I don't think I would use the choker hitch as an anchor. The rigging should really be more stable than that, at least in my book. And it should also keep the rope away from things touching it. I guess it sort of depends on what you think of as acceptable practice. Is the choker hitch an acceptable way to anchor a rope? I would say yes. Is it acceptable all the time? No. the hitch are actually the two sides of a single loop knot. for this non-slipping grip, detrimental for its load amplificaiton). vis-a-vis the tape's cross section)! as the latter is varied by circumstance of material / force. Distinctions, sensibly made, should help, yes. names) is not so helpful because of its many meanings. On the other hand, that is also the case for the water knot--the tails can gradually slip through...but you'd have to load it cyclically for a very long time without inspecting it to make sure it was still OK.
NO slippage, 3/4" solid Nylon to have slippage, and 9/16"
load of 50# suppressed the effect completely. Bowlines and figure-eight follow-throughs can be clipped into with a cowstail. [i]SECURED Bowlines, you mean (is that universally agreed?) ! The common bowline can quickly spill if ring-loaded. ps: "Perhaps William Safire can shed light on this matter..."
from the Great Beyond ?